Is The Latest Tiny Price Correction In Gold Price Already Done? This is the daily gold chart. The uptrend looks majestic, and especially so in the face of the dollar’s strength against the euro and the yen. Whether gold rallies from the current $1306 support zone or from $1280 is not important. What’s important is the overall strength of the market, both fundamentally and technically. A staircase uptrend pattern (in place now for gold) is an indication of a very healthy market. 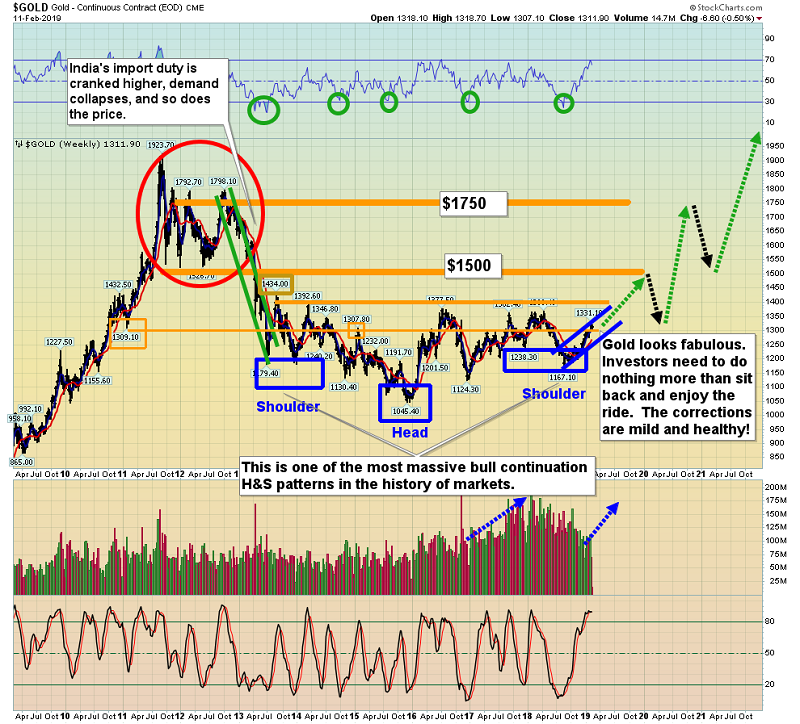 The big technical picture for gold is also glorious! On the fundamentals front, the European economy is rolling over faster than America’s is right now. This situation is positive for gold. Europeans are nervous, especially in Germany, and they are steadily putting money into gold and physical gold ETFs. The dollar is strong against the yen because of the rally in global stock markets. That rally is happening in the face of fading US corporate earnings because of the actions of the US central bank. Stock markets initially tend to rally as the US business cycle peaks and the Fed stops raising rates, but institutional investors soon become concerned that the Fed’s about-face is related to more serious concerns about the economy. Value players have sold out and many money managers are now in a “sell the rallies” mindset rather than “buy the dips”. The Fed’s change of stance is good news for gold but not so good news for the stock market (except in the very short term). Rates have barely risen off the floor despite this being one of the longest economic upcycles in the history of America. The upcycle was long in terms of time but horrifying in terms of actual growth. Arguably, the biggest real economy growth has been in the part-time jobs market. It’s also plausible that there would not have been any growth at all without the massive increase in government debt. The democrats have control of the House now and some influential players want to tie stock market buybacks to wage increases. That’s clearly inflationary and perhaps much more so than most analysts realize. Even if the legislation doesn’t get passed, I believe it will be passed “in spirit”. Key democrats also support the UBI (universal basic income) and free medical care. I’ve dubbed UBI the common man’s QE. These programs are all inflationary and are being proposed as the Fed changes its stance. That’s a “done deal” recipe for major stagflation over the long term. In the current big picture, I’ve suggested that rate hikes, QT, QE, and rate cuts are all win-win for gold. Rate hikes put pressure on the stock buyback programs and help push the QE money ball in the commercial banking system. That’s inflationary. Rate hikes also put pressure on the US government’s ability to finance itself. That’s positive for gold. 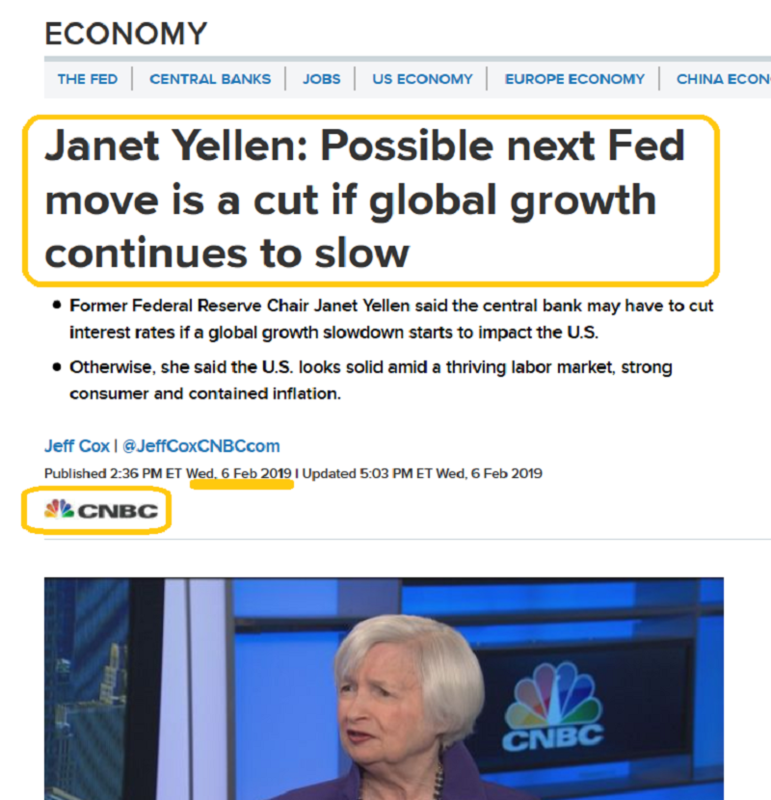 Rate cuts now reduce the carry cost for gold and boost the safe haven trade as investors flee stock markets as the fear of recession grows. That’s also positive for gold. Kudos to Congressman Mooney for doing the right thing. 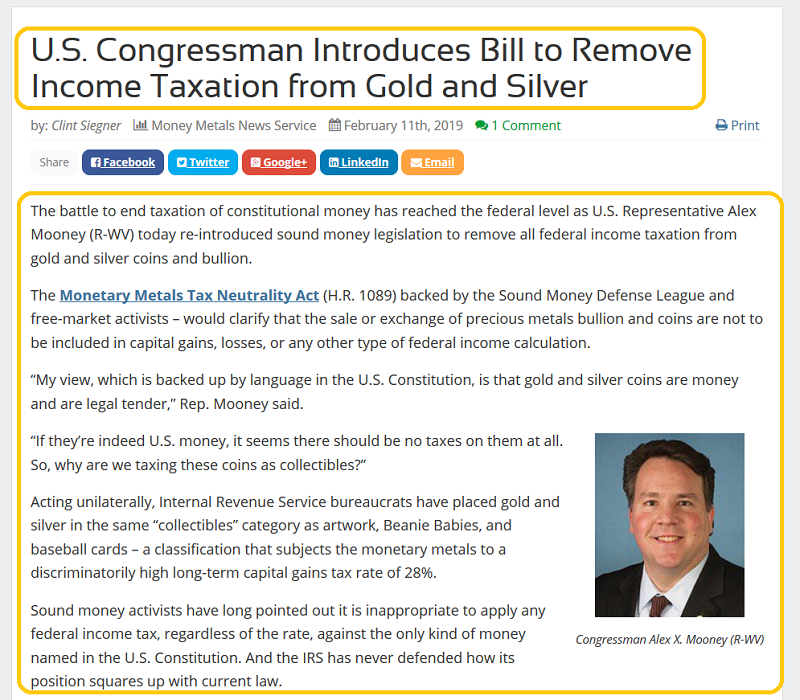 I urge all members of the US gold community to call their congressional reps and demand they back Mooney’s proposed legislation. 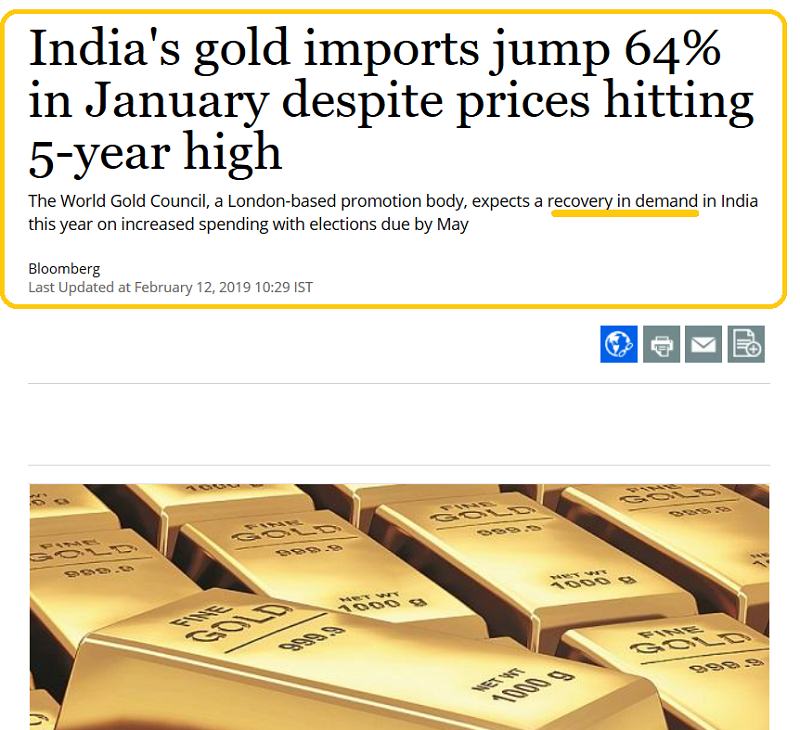 I’ve predicted that with China and India leading the way, gold will become an “approved and respected” mainstream asset in the years ahead, just like stocks and bonds. If Mooney gets serious support, it can happen even faster than I’ve predicted. As noted, the big picture for gold is glorious… both technically and fundamentally. 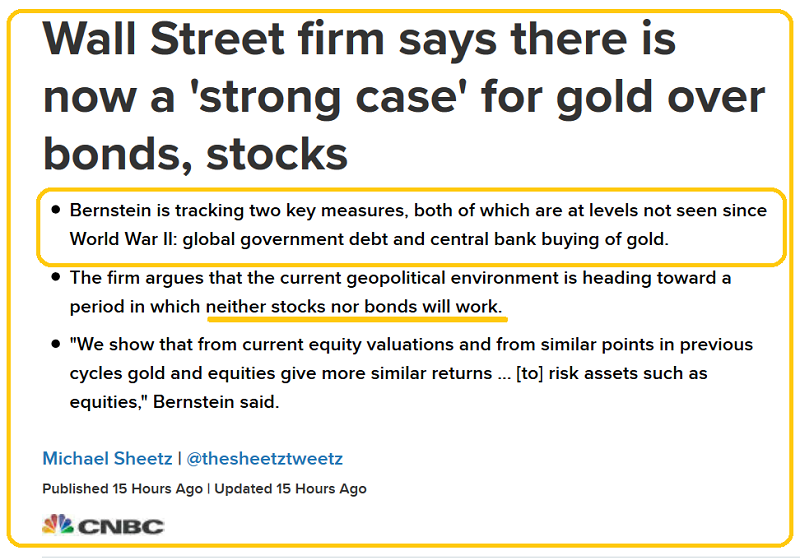 Respected mainstream firm Bernstein has obviously joined “Team Gold”. They highlight the ongoing drop in America’s share of global GDP. Nothing Trump is doing will reverse that drop because it’s related to the West’s horrifying population demographics. The current US government plan to reverse its insane debt growth with tariff taxes, a single corporate tax cut, a few regulatory red tape chops, no more rate hikes, and a border wall… is like trying to stop Niagara Falls by throwing a few popsicle sticks into the water. The temptation for the debt-worshipping US government to inflate will soon be overwhelming. Clearly, elite US analysts like Bernstein are already anticipating this is an imminent event. This is the fabulous GDX chart. GDX and most high-quality gold stocks soared from September-December and did so while the US stock market crashed. Then GDX soared in January while the stock market rallied. 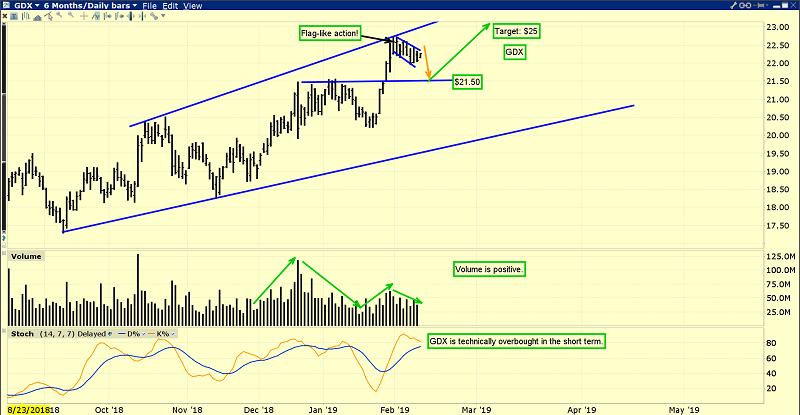 There’s now a bull flag in play and while gold looks great in this price correction, GDX looks even better. 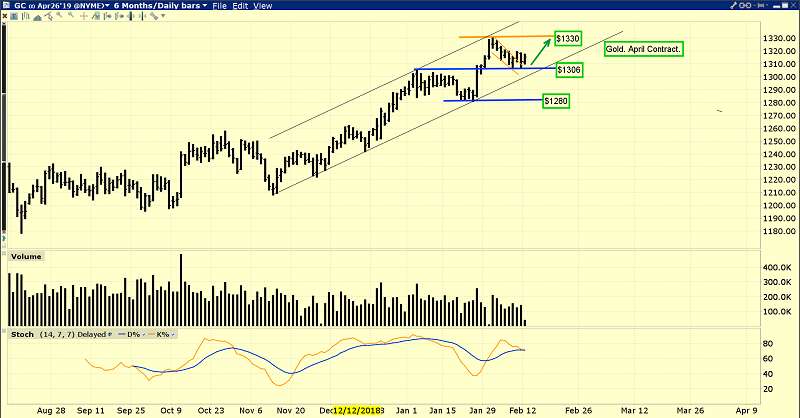 The $21.50 support zone for GDX is the equivalent of $1306 for gold, but the price hasn’t even reached that $21.50 level! There’s still a high probability that GDX blasts towards my next short-term target at $25 without even touching that support zone. That would be “outrageously bullish”. I refer to GDX as the “Prince of Assets” and to high quality individual gold stocks as “Knights Of The Round Bull Era Table”, and with good reason; it’s a glorious time to be invested in gold and the companies that mine it! These price corrections are not painful. They are so mild (and even enjoyable) that it’s almost ridiculous. The good news is that this theme is now poised to continue… for a very long time! Special Offer For Gold-Eagle Readers: Please send me an Email to freereports4@gracelandupdates.com and I’ll send you my free “Walking The ETF Components Talk!” report. I compare the relative merits of the main precious metals ETFs and evaluate the top three performers in each ETF. Email me today, and I’ll send it to your inbox today!